A year ago, we looked across the street at Lower Courthouse Park with anticipation and frustration. The banquettes were a month behind schedule. Equipment was on order. There were delays all over the place and so the Memorial Day grand opening became June 15 and then a month later. The first night we opened the doors for a “soft opening” was also the night of the last concert of the city’s Main Street Entertainment Series. It happened to be the night when the band I play with, the GoDeans, was performing across the street. It was very weird to be up on the Marvin Roth Pavilion playing and singing, then turn around to see people seated at our bar. And then the park got quiet and it felt like summer slipped away. Not this year. We have so much planned for the summer that it makes my head spin — in a good way. Sidewalk seating. Supposedly our two tables on the sidewalk are something new for Janesville. I’m just excited that people can eat and drink outside if they feel like it. On the first night, we had a group that hung out until late eating, drinking wine and having a great time. That was fantastic. Tuesday take-out. The Main Street Entertainment Series starts up on Tuesday, June 5, and this time we’re ready. We will have $8 burgers, McKenna Farms brats and tikka tacos and cucumber-ginger lemonade to go. And the GoDeans will be back on June 19 for a concert (always my favorite place to play). 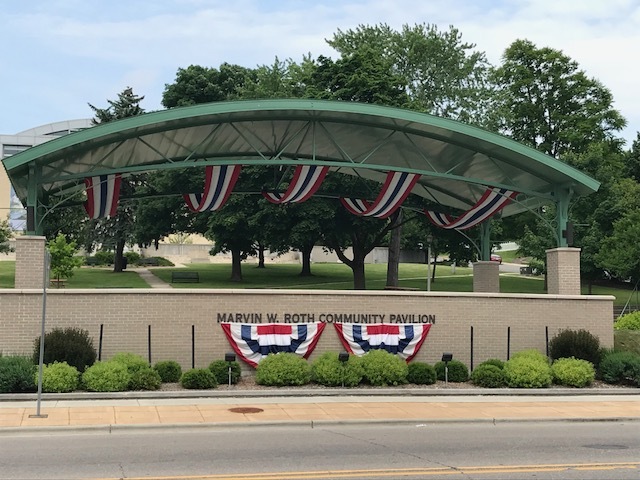 Downtown Janesville, Inc. is extending the season with a 608 Day concert on Friday, June 8, and sponsoring bands that start up when the city series ends that last through August. We will offer a take-out menu for all of those dates. Or you can enjoy that sidewalk seating and order from our regular menu. Live music on Thursdays. About a month ago, we started featuring local musicians starting around 7:30 p.m. on Thursdays. Our friend John Nelson of Johnny Can’t Stop is a regular every other Thursday. He even lets me sing with him, which is extremely kind of him. Duane Worden and Fran Peyer are rounding out our June schedule. Pig & Brew dinner: We’re throwing a special dinner on Wednesday, June 13, with our friends at McKenna Farms and Gray’s Brewing Company. Reservations are $60 per person for a four-course dinner with drinks and a ticket for a brewery tour. There are still seats left, but they’re going fast so let us know if you’d like to come. There’s a menu on larkjanesville.com/events. Scotchy Scotch & Other Stuff Class: Richard and Billy are scotch and whiskey freaks and so they are really excited about this. From 1:30-3 p.m. on Saturdays, June 16 and 23, we’re hosting tastings and classes that feature some of the finest spirits from around the world — stuff you usually don’t come across. The class is $75 and seating is limited. It would make a great Father’s Day gift for someone special. 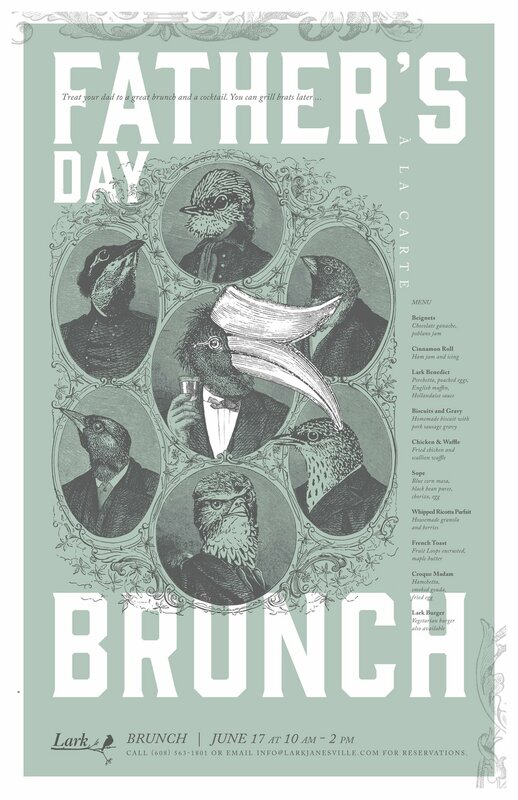 Father’s Day Brunch: We were hoping to make brunch a regular Sunday feature after Mother’s Day, but summer staffing was an issue so now we’re looking at starting it in September. In the meantime, we’ll be offering the same brunch menu we had on Mother’s Day from 10 a.m. - 2 p.m. on Sunday, June 17. Doesn’t your dad deserve as good a brunch as mom? Grand Prix: We are really excited to be part of the bike race on Tuesday, June 26, that will encompass most of the downtown from morning until night. Main Street will be closed down and we’ll be set up on the street with food and drink specials for cyclists and spectators. Lark in the Park: We are throwing a big birthday party on Wednesday, July 25, which happens to be the one-year anniversary of our “official” opening. We’re bringing in Madison blues/rock band The Jimmys for a concert at the Roth Pavilion from 6-8 p.m. and closing down the street for a big picnic/party. No reservations necessary, just be ready to have fun. In addition to featuring some wonderful musicians, we’re very lucky to work with some incredibly creative local talent. Heidi Rossiter of Mod Bloom has created a beautiful flower arrangement for our bar almost every week since we opened. We love her creativity and positive energy and hope she can keep fitting us in during her busy wedding season. And then there’s Jorel Dray. I worked with Jorel about a decade ago at Hiebing, a branding agency in Madison. He lives in Janesville and we would run into each other every once and awhile. When he agreed to design our event posters and collateral I was so thrilled, not just because he’s a great artist. He’s such a smart, sweet guy that it’s nice to have an excuse to work with him again. Our kitchen and front-of-house team are an incredible group. They are truly the heart and soul of Lark. Many of them have been with us since shortly after we opened and they share our passion for delivering an exceptional experience. Dumb luck or good karma, I don't know, but I'll take it. As we start our first full summer with Lark, Richard and I feel blessed to get to know so many creative, passionate people who are bringing the downtown back to life. With the Town Square, exercise park and festival street all becoming realities this year, it truly feels like we’re turning a corner. So happy summer. We've got some great stuff planned. Hope we see you soon.